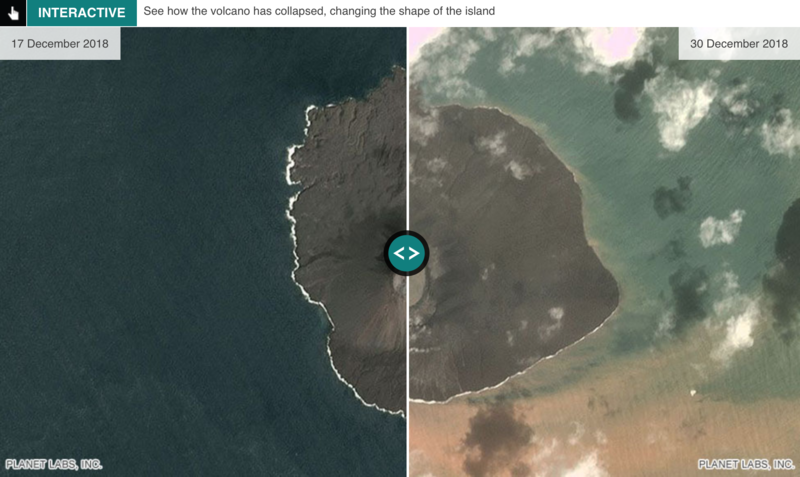 A few weeks ago we took a look at an interactive piece from the BBC that used a slider to show before and after photos of Anak Krakatau. For those that forget, that was the volcano that exploded and created a tsunami in Indonesia, which killed over 400 people. 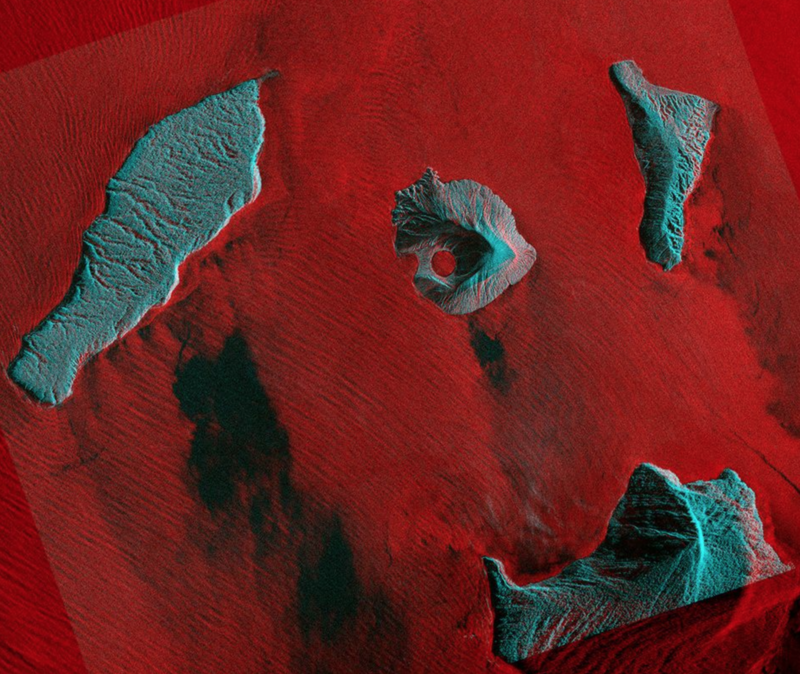 Well, geography is always changing and so has the shape of the volcano. The BBC published a piece about two weeks ago that looked at new details from a Finnish radar satellite. These show how the crater of the volcano has been cut off from the ocean and is now a little lake. This piece is not really revolutionary in its design. But it does provide a nice follow-up on a story that piqued my interest. Credit for the piece goes to ICEYE. During my winter holiday to London the volcano Anak Krakatau erupted, sending enormous amounts of material sliding into the ocean. The displaced water had to go somewhere and travelled as a tsunami that devastated the Indonesian coastline. Of course Anak Krakatau is one of several remnants of the much larger volcano of Krakatoa that erupted several times, perhaps most famously in 1883. Anak Krakatau specifically emerged in the late 1920s and has been building ever since until it collapsed almost two weeks ago. But by how much did it collapse? Until just a few days ago, the skies above the volcano have not permitted detailed photography. But within the last day or so we have started to get images and the BBC put together this piece that looks at Anak Krakatau before and after. It is a fairly common convention these days, the slider overtop the two images. But conceptually it shows clearly how the shape of the island has changed, in particular the new bay that has emerged. The other remarkable feature is the extension of land to the presumably east (right) of the image. As a kid, volcanoes fascinated me. The idea that the molten core of the Earth can bubble its way up to and then erupt from the cold crusty surface of the planet still fascinates me. Of course, volcanoes can also have drastic impacts on people, both at the grand scale of impacting global climate to the smaller and more personal scale of someone’s home destroyed by a lava flow. And unfortunately for residents of Hawai’i that personal destruction is unfolding across a development called Leilani Estates. The Washington Post has a nice piece detailing the geography of the area and showing how quickly things can change. 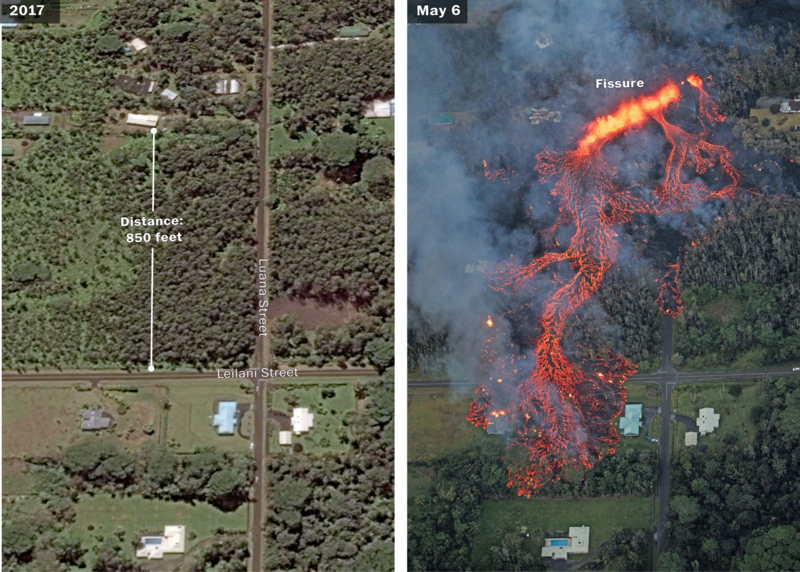 The article uses the photo above to illustrate the distance the lava flow travelled in only a few days. It also shows how precariously sited the homes are. Only because I am so fascinated by these kinds of stories, I hope the Post continues to expand its content with pieces like this exploring the eruption and those of other volcanoes in the area. Credit for the piece goes to Laris Karklis and Lauren Tierney. Happy Friday, everyone. 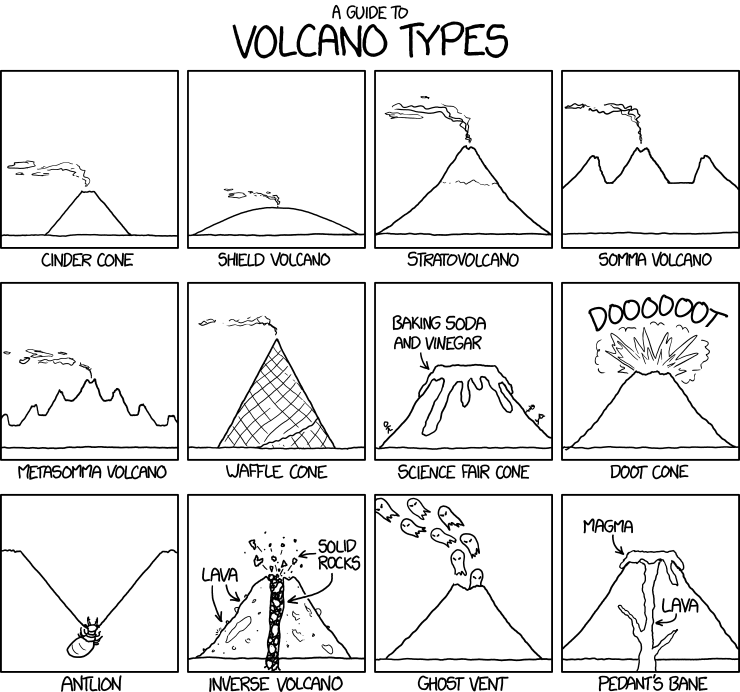 Xkcd had a post this week about volcanos and it is an illustrated guide to the various different types of volcanos that exist. Well worth a look.